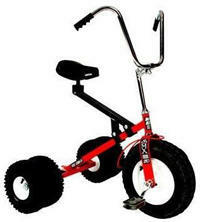 If you enjoy watching people do silly things at your events, try our Wacky Trikes or giant tricycles. Our sturdy Wacky Trikes handle up to 300 pounds and come with large comfortable seats. They are safe and fun for all ages and are guaranteed to create laughter for everyone at the event. If they can reach the pedals, then they are ready to race. 3 people choose their Wacky Trike and race in either the inflatable race track or through cones to the checkered flag. The track you choose can be set up inside, outside, hard surface or grass. The rear dallies allow for a more stable ride.